Ralph Waldo Emerson once remarked that a weed is a plant whose virtues have yet to be discovered. Perhaps Emerson's sentiment can be contemplated little more than just a fanciful consideration as one weeds the beds. At least in some parts, we seem to have eased up on the dandelion, that sense of urgent immediate eradication from all lawns and gardens has diminished as of late. Spending an afternoon tugging at green stout stems may turn the toughest of prejudices, but our most virtuous botanical meditations may indeed be challenged when the chain saw comes out. Ailanthus altissima, otherwise known as tree of heaven, is an urban weed that can reach upwards of 80 feet. Native to China, it was introduced to the United States by a British gardener in the 18th century and later by Chinese migrant workers that settled in California during the Gold Rush. Although initially valued as an ornamental and later as a street tree, its rapid diffusion has lead to its current noxious weed status. 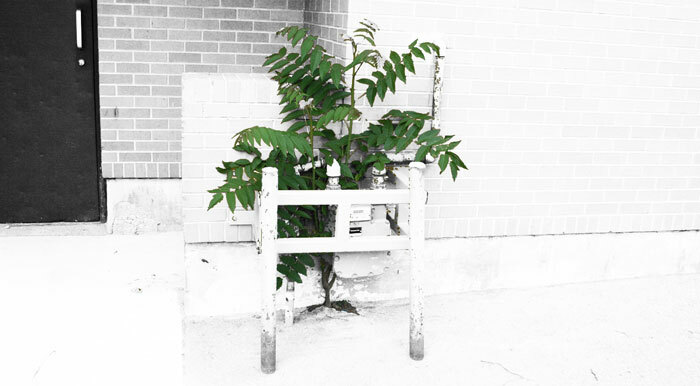 As a city tree, Ailanthus grows along side buildings and railways, in abandoned lots and cracks in the pavement. The sole thriving occupant of urban concrete landscapes. The large arching leaves consist of small leaflets arranged in opposite pairs. The bark is a pale grey and the seeds, occuring in clusters, are wing-shaped. Although it may flourish unthreateningly in urban settings, the tree's sudden appearance in the garden can elicit alarm and earnest eradication tactics from many homeowners. The canopy has been sheered, the trunk cut and the formidable roots wrestled out of the ground. As a sapling, the exotic import can easily be mistaken for native species of sumac, ash, or black walnut. If left to grow without intervention, the specimen's mighty and irrepressible nature easily yields to its alternate namesake, tree of hell. As experienced gardeners will tell you there is little else that grows in the tree's vicinity. 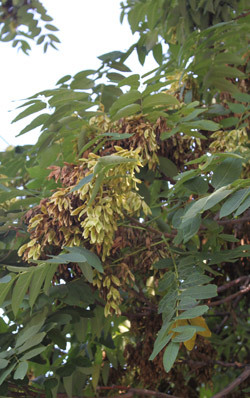 Ailanthus produces toxins that suppress the establishment of neighbouring plants, making it not only a nuisance in the garden, but a particular threat in natural habitats. When a mature tree is cut down, sprouts rise up from the stump as well as the roots and can populate a yard by the hundreds. Having long been among America's most wanted on the Invasive Plant Watch List, have its virtues entirely escaped us? For the Chinese immigrants that came to California in the Gold Rush of the 1850's carrying Ailanthus seeds with them, the tree was a medicinal source. Highly valued in Traditional Chinese Medicine, the tree of heaven has therapeutic applications that treat a host of ailments, including asthma, baldness and digestion ills. In cities, the tree's ability to tolerate pollutants and survive all manner of neglect can itself be a virtuous quality. The Tree of Heaven Woodshop, a Detroit-based collective of artists, craftspeople and researchers works solely with the species. According to their website, the tree is considered "a significant plant of post-industrial landscapes." Common throughout Detroit's abandoned and neglected lots, the tree is harvested by the collective and the wood is reworked into furniture and sculpture. Whether reviled, revered, or rediscovered, Ailanthus altissima has become a distinct and permanent feature in our urban forest. Photo credits: Mikael Lavogiez, Barbara Ozimec.